Today is supposed to be the best day of the year for me; the summer solstice – the longest daylight hours in the year. From now on, it will feel like a decline into the months of darkness. But, yesterday was one of the worst days of my life and is going to take a bit of recovering from; and an experience I never want to repeat. I was already feeling delicate and the data breach tipped the balance. The comments following my decision to stop ‘GP and Human’ have been lovely and I’m very grateful. I personally do not want to stop and I am going to miss it and those that follow it tremendously; you have all been incredible. I am told it has done a lot of good and that is something I would like to continue. I feel I have a lot more to offer; insight into mental health, wellbeing strategies, insight into the life of General Practice/the NHS and how the general public can support it etc. And simply making it OK to talk about the taboo subject of mental illness, especially in doctors. It’s helped me and apparently helped others too based on the numerous positive comments and private messages I have had over the last few months. So many of us are in the same boat and it has opened up communications for us to be able to support each other and feel less alone in our struggles. Many others have similar blogs and social media pages and use images such as the one that I made a mistake on; an error like that is always a risk and I got it very wrong this time – it could have happened to any of us (especially as it was almost invisible overall but possible to see when zoomed in – hence I, and others, didn’t even see it at first). It was only public for a very short while as I deleted immediately as soon as 2 kind people notified me and I was going to discuss it with my practice. I feel sad and betrayed that someone chose to go behind my back and report it before I had a chance. Although technically it is the right thing to do, open communication with me would have been preferable and a million times less hurtful. 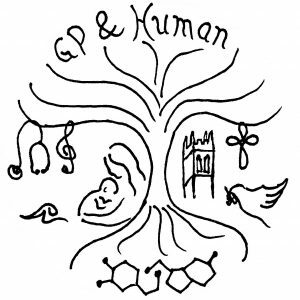 ‘GP and Human’ has to stop, at least for now; it is not currently a choice I feel is in my hands. My practice are concerned about it negatively reflecting on them; I have a declaration on my site saying my blog is nothing to do with my employer but it is an absolutely valid concern and I respect that (although my practice are most definitely not a reason for my struggles; they have been greatly supportive). The data breach mistake is serious and I wish I could turn back time. I am mortified, embarrassed and ashamed; I feel like a child that has done wrong, although rationally I shouldn’t. But it happened and I have to deal with it, they have to deal with it and it is, quite understandably, the straw that broke the camel’s back. Maybe one day, my blog might be seen favourably again, but cons certainly overshadow any possible perceived pros currently. Fair enough. I am not closing ‘GP and Human’ down completely; it will just be sleeping. My website has far more than my drivel on it; resources etc too. I have worked hard on it and am not prepared to delete it (I actually use it myself as a place to store useful links etc). The social media accounts will stay live, partly as they host the support groups which are used and needed and I am not prepared to let these people down. I may still post or share the odd ‘benign’ thing too. ‘Glos. Medics Meet’ I hope will grow and isn’t directly to do with the blog anyway; I just happened to create it, as a consequence of my situation, as peer support locally as I felt there was a need for that. I will still be writing in the background as that’s part of what I need to do to process for myself but I will just leave it unpublished. Indeed, there is a lot I write that I never publish that is more personal and just for me. For now, I’m going to try and focus on some other elements of recovery and self-care; elements that I have found harder to instigate, but that I need to do to get well and stay well long-term. So, I am not disappearing and maybe one day, it will be appropriate to wake ‘GP and Human’ up from its sleep.